A critical piece of this social layer is a design that grows alongside our aspirations. So today we’re introducing a more functional and flexible version of Google+. We think you’ll find it easier to use and nicer to look at, but most importantly, it accelerates our efforts to create a simpler, more beautiful Google. Taken together, these powers make it easier to access your favorites, and to adjust your preferences over time. We’ve also built the ribbon with the future in mind, giving us an obvious (and clutter-free) space for The Next Big Feature, and The Feature After That. So stay tuned. Simply put, we’re hoping to make sharing more awesome by making it more evocative. You know that feeling you get when a piece of art takes your breath away, or when a friend stops by with unexpected gifts? We want sharing to feel like that, every single time. By highlighting all the hangouts you can join, all over the world, it’s now easier to spend time together—even be there for each other. 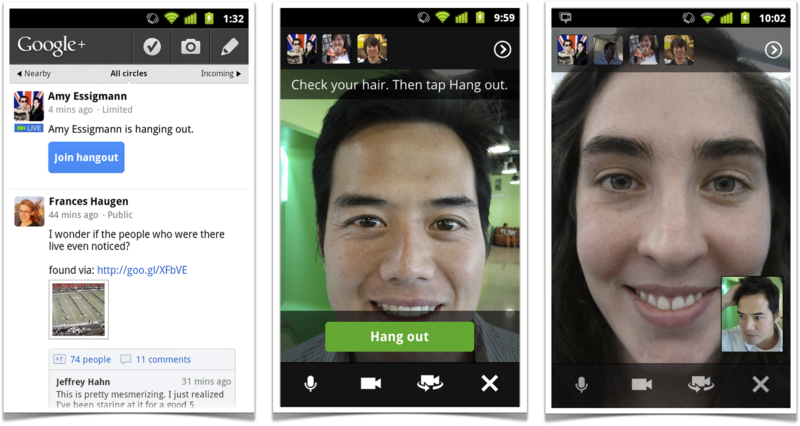 And with efforts like hangout apps already underway, you can expect more hangouts in more places in the future. Today’s Google+ update extends beyond navigation, the stream and hangouts. For instance: there’s a new Explore page that shows what’s interesting and trending across the network. And a new profile with much bigger photos. And a new chat list that puts your friends front and center. And a whole lot more. We’re rolling out all of these improvements over the next few days, so please check back if you don’t see them yet. In the meantime, you can visit this overview to learn more. By focusing on you, the people you care about, and the stuff you’re into, we’re going to continue upgrading all the features you already know and love—from Search and Maps to Gmail and YouTube. With today’s foundational changes we can move even faster—toward a simpler, more beautiful Google. All too often, physical distance and frantic schedules get in the way of spending time together, especially during the holidays. But you know what? They don’t have to. With Google+ Hangouts, you can go beyond “status updates,” and connect with the people you care about using multi-person video. For free. And today we’re rolling out a number of improvements that make it even easier to say hello to your loved ones, face-to-face-to-face. Certain posts act as kindling for face-to-face interaction. Suppose your sister gets engaged, or your roommate lands a job, or your favorite singer shares their concert schedule. You can obviously write comments back and forth, but it’s moments like these when you really want to connect in person. That’s why we’re making it easy to start a hangout from any post on Google+. Just click “Hangout” underneath a post that you’re passionate about, and we’ll add your invitation to the comments. If others are hanging out already, you’ll see their invitation in the comments as well. 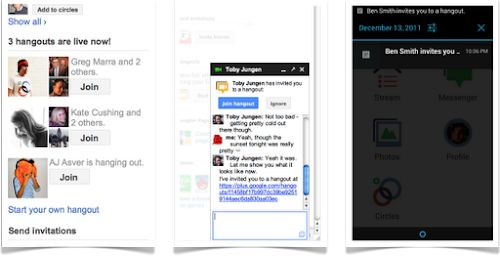 The desire to “go live” isn’t limited to your desktop computer, of course, so we’re also bringing hangouts to Google+ Messenger on mobile devices. Simply tap the new hangout icon when the time is right, and you’ll flip from text and photos to smiles and laughter. In the meantime, you can still watch or join On Air broadcasts directly from the stream. Just look for the red banner while reading your posts or checking your hair, and you’ll know you’re in the right place. By bringing people together, face-to-face-to-face, we’re hoping to make the world a bit cozier, and lift people’s spirits a bit higher. So give hangouts a try this holiday season, and let us know what you think. A few weeks ago Larry mentioned that we’d start shipping the Google part of Google+. The Android team then launched Ice Cream Sandwich, with a focus on improved sharing via Google+. 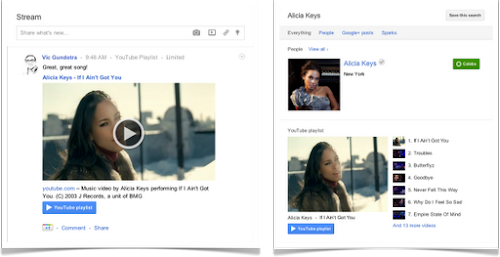 And today we’re rolling out two more Google+ features that integrate with two more Google products: YouTube and Chrome. It’ll slide out and ask, “What would you like to play”? Sharing YouTube videos with your circles also works (of course), but there’s a nice little twist: the people you share with can open a related playlist directly from your post! Last but not least, we’re starting to include YouTube playlists in Google+ search results. Of course, if you don’t use Chrome, then you can use Google Toolbar for Internet Explorer. The new version—also rolling out today—includes these same sharing and notification features. We’ve got lots more planned for Google+, YouTube and Chrome (and all the other Google products you already use). But we hope you enjoy today’s small taste of shipping the Google in Google+. Google+: 92, 93, 94, 95, 96, 97, 98, 99… 100. For our international readers, this post is also available in Chinese, French, German, Italian, Japanese, Portuguese, Russian and Spanish (Latin America, Spain). – Ed. The Google+ project has been in field trial for just under 90 days, and in that time we’ve made 91 different improvements (many of which are posted here). Google+ is still in its infancy, of course, but we’re more excited than ever to bring the nuance and richness of real-life sharing to software. Today we’re releasing nine more features that get us that much closer. 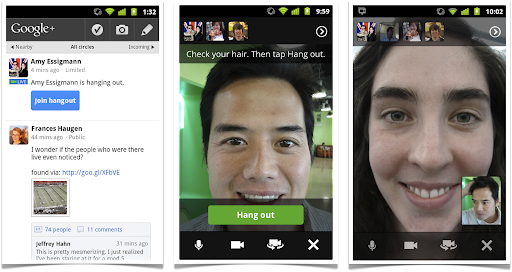 Hangouts uses live video to bring people together, face-to-face-to-face. And from day one, the community has shaped and stretched the feature in amazing ways—from cooking classes to game shows to music concerts. We’re determined to keep this momentum going, and to keep providing new ways to communicate in-person, so we hope you enjoy this week’s round of Hangouts improvements. 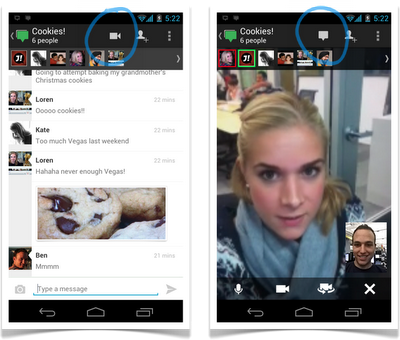 Hangouts currently supports Android 2.3+ devices with front-facing cameras (and iOS support is coming soon). The new mobile app is rolling out to Android Market today, so you can start hanging out at any time, from just about anywhere. Google+ users already use Hangouts to create intimate onscreen experiences—with family members, prayer groups, even people with certain medical conditions. But sometimes you want to speak to a large audience, or alternatively, view as a spectator. In these cases a public broadcast is what’s needed, so today we’re introducing Hangouts On Air. We’re starting with a limited number of broadcasters, but any member of the Google+ community can tune in. In fact: we’ll be hosting our very first On Air hangout with will.i.am on Wednesday night, September 21. For more information visit will.i.am’s or my profile on Google+. The extras are still under construction, but we wanted to preview these features and get your feedback sooner versus later. So start a hangout, click “Try Hangouts with extras” in the green room, and let us know what you think. If field trial has taught us anything about Hangouts, it’s that the community is overflowing with creative individuals. 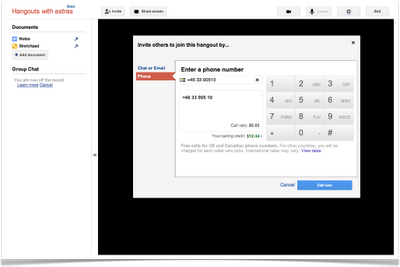 So in the wake of last week’s Google+ API launch, we’re also releasing a basic set of Hangouts APIs. If you’re a developer who wants to build new kinds of apps and games (and who-knows-what-else), then you can find more details on the Google+ platform blog. You’ve been asking for it, and we’ve been busy building it, so today we’re bringing Google’s search expertise to Google+. Just type what you’re looking for into the Google+ search box, and we’ll return relevant people and posts, as well as popular content from around the web. If you’re into photography, for example, then you’ll see other enthusiasts and lots of great pictures. If you care more about cooking, then you’ll see other chefs and food from around the globe. In all cases, Google+ search results include items that only you can see, so family updates are just as easy to find as international news. With more than 1 billion items shared and received every day, we’re excited to see how search will connect people through their posts on Google+. Over the next day we’ll be rolling out all of these features globally. In the meantime, you can check out what’s next in Google+.